Duo held for trying to sell million $ note! A $ one million note! The Link Road police were flabbergasted when they were informed that two persons were trying to sell a $ one million note in the border area of Sahibabad. The duo, a transport company proprietor and a ‘tantrik’, were arrested with the note which, according to the police, has a market value of Rs 4.80 crore. Faridabad, once known as the Manchester of northern India and seen to be coming up as an alternative residential abode to the neighbouring Delhi, has offered only a messy state of affairs. The town with the largest population in Haryana has left many a dream shattered. Uneasiness is palpable among the residents of Bahadurgarh and the surrounding villages following the notification to acquire 1,350 acres of land of these villages by the Haryana Urban Development authority (Huda), to develop residential sectors in the area. The district administration is all set to recover the pending power bills to the tune of Rs 36.2 crore in rural areas. The plan follows the announcement of a special scheme in which the state government has offered to waive off 75 per cent of the bills if 25 per cent of the amount is paid in a single instalment. Observing that encroachment on public land is a serious issue, the Supreme Court today, while referring to the encroachment on public land, roads and pavements in Lajpat Nagar in South Delhi, firmly told the Commissioner of Municipal Corporation of Delhi that the issue would be taken to its logical conclusion. 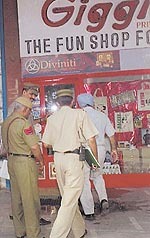 THE Delhi police seem to be stepping up its drive against cars with heavily tinted glasses. The timing of the campaign is striking as the summer heat makes passengers to roll up the darkened glasses. In 1998, on a PIL, the Delhi High Court had issued notices to the Delhi Police Commissioner, Delhi Government and the Union Government as to why the ban on tinted glasses under Section 100 of the Central Motor Vehicles Rules, 1989 was not being implemented seriously. Hundreds of Congress activists led by Capt. Ajay Singh Yadav, deputy leader of the Haryana Congress Legislature Party, staged a dharna outside the main entrance of the District Secretariat here on Wednesday in protest against the anti-people policies of the Haryana Government, as well as the failure of the Modi government to contain the communal carnage in Gujarat. The president of the Haryana Pradesh Janata Dal (U), Mr Ved Parkash Vidrohi, today urged the state government to fix the minimum wage of the industrial and other categories of workers at Rs 3,500 per month to safeguard the interests of the working class. The CPM, Haryana has offered greetings to the entire working class on the occasion of May Day and expressed confidence that the working class would take pledge to successfully fight back the aggressive globalisation launched by neocolonialism. On the receipt of an information about the kidnapping of a couple on the same night they were married on Monday, the Delhi and the Haryana police launched a joint search of vehicles on the G. T. Road and other state highways throughout the night. The search failed to achieve any breakthrough. By morning both the bridegroom and bride were found safe in the groom’s house at Bahadurgarh. The fire that broke out at the New Grain Market in Ateli Mandi, 15 km from here, on Tuesday has not been extinguished yet. Thousands of bags of wheat purchased by the HAFED have been affected so far even as the Deputy Commissioner has claimed that there is not much damage. There was a steady rise in the water level in the Yamuna river, near Sonepat, following the release of 1.50 lakh cusecs of water from the Tajewala Headworks by the officials of the Haryana Irrigation Department. Even as the taps go dry in several parts of the Capital, the Delhi Jal Board is contemplating hiking the water tariff in order to make investments in water resources projects to meet the future requirements of the Capital. 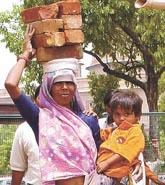 An acute scarcity of drinking water continues at Balaha Khurd and Nangalia villages, where women are commonly seen roaming around with pitchers on their head, looking for potable water. With the arrest of Naresh Dixit (37), a registered MCD contractor, the Delhi Police today claimed to have unearthed a cement misappropriation racket. The material was allotted to the suspect for construction of drains. The quality of the construction drains was reportedly of inferior quality. The Municipal Council and the Improvement Trust along with the district administration look the other way while the vendors set up stalls illegally in various parts of the city. Suspecting that old business rivalry could be the motive behind the sensational murder of former vice-president of the Delhi Pradesh Youth Congress Committee, Parvinder Kumar Arora, the Delhi Police today sent teams to the neighbouring states to nab the culprits. The Delhi Police have arrested an employee of a private firm who allegedly murdered his wife and later himself called up the police claiming she had been raped and killed by someone else. The last date for the submission of application forms for the admission to B.Ed (regular) course of Maharshi Dayanand University, was extended to 10th May, with a late fee of Rs five hundred. Earlier, the deadline for submission of application forms was 1st May. The entrance test would be conducted on 9th June. 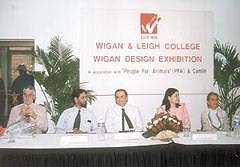 For environs: Mrs Meneka Gandhi at the inaugural function of three-day Wigan Design Exhibition with Lady Catherine Young, wife of British High Commissioner. WIGAN and Leigh Design College organised a design exhibition showcasing designs and artworks of more than 2,000 students. The theme for the exhibition was ‘Environment’ and the artwork of the students focussed on the topics such as cruelty on animals, peace on earth, be vegetarian and India – 50 years from now. Punjab National Bank chairman and managing director S S Kohli announcing the launch of the PNB hockey academy, watched by former Olympians Ajitpal Singh and Harbinder Singh in the Capital. Good times, it seems, are rolling in for Indian hockey. The Punjab National Bank, the largest nationalised bank in the country, will soon launch a hockey academy with the “aim to developing talented youngsters to become quality players without sacrificing their educational careers”. Varun Kumar produced remarkable batting pyrotechniques to make 124 with 12 fours and five sixes to guide Chand Khanna Club to a 41 runs victory against Telefunken in an A-I Division match of the DDCA League at the University Ground. A fine all-round performance by Tajender Singh (78 and 3 for 12) and deadly bowling of 4 for 10 by Ashish Choudhary helped Government Senior Secondary School, Vikas Puri beat Jaat Heroes by 49 runs in the Jayant Devi Under-15 Cricket Tournament at the Vikaspuri ground. The Air-India National Hockey Academy will hold selection trials at the Maj Dhyanchand National Stadium from May 3 to 5 to select ten boys for the academy. The selected boys will be drafted into the academy on May 15. Boys who were born on or after January 1, 1985 are eligible to appear for selection trials. Top 13 school teams from all over the country are participating in the 12th Afzal Khan Basketball Tournament, being held at Doon School, Dehra Dun. The Haryana Irrigation Department has issued an order transferring 25 employees from the Rai and Sonepat Water Service Divisions to the Delhi Water Service Division with immediate effect. According to a report, this has caused widespread resentment among the employees and they are planning to launch an agitation on the issue.